more than 20,000 people to evacuate their homes on Saturday, May 13, 2006. - 1994 Eruption killed about 70 people. - 1930 eruption killed 1,370. Mt. 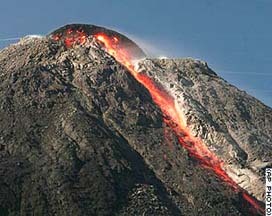 Merapi volcano near heavily populated Yogyakarta, Indonesia, on May 13, 2006. Rising 9,700 feet (2,900 meters), Merapi has been steadily active for more than a decade. Image © 2006 by AP.